The New York Times last week posted an album of rarely seen photos of Billie Holiday. 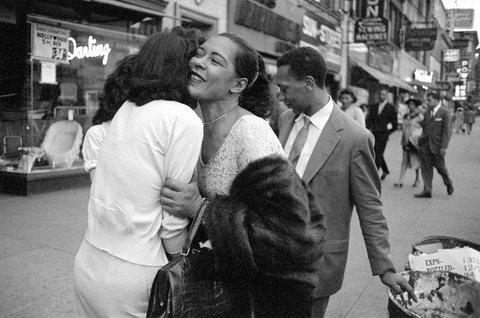 The pictures were taken by Jerry Dantzic in 1957 during her engagement at Sugar Hill on Broad Street in Newark, New Jersey. As the Times blog by John Leland notes, Billie had been denied a cabaret card for nearly a decade at that point, and without it she was unable to work in New York establishments that served alcohol, i.e., nightclubs. Billie appeared occasionally at Carnegie Hall, the Apollo Theater, and other New York concert halls, but she was dependent on out-of-town nightclub bookings to sustain a livelihood. Thus Boston, New Haven, Newark, Philadelphia, Baltimore, and Chicago became frequent stops for Lady Day. The photos are from the new book Billie Holiday at Sugar Hill, published by W.W. Norton. It includes a text by Grayson Dantzic, son of the photographer, and an introductory essay by Zadie Smith, who discussed Billie in this interview published in The New Yorker. The magazine also published Smith’s essay for the Dantzic book, “Crazy They Call Me,” in its March 6, 2017 issue. I assume she’s referring to the seventh image in the series of thirteen on the Times blog. If so, I see a very different exchange going on, one that certainly conveys the enthusiasm of two young “bobby-soxers,” but that also captures Billie in what appears to be a look of warm appreciation over their glee. The image above looks to be from the same on-street meeting, and the smile I see on Billie’s face and the grip of her hand on her fan’s arm reads anything but “bored.” But Smith’s projection on Billie seems not to allow for the possibility that the Lady may have needed the love and adoration even more than her fans needed her “love, music, money, smokes.” I’d be glad to hear what you see, or anything else you’ve got to say about Billie. Illness notwithstanding, I ventured out into the bitter cold of Saturday night for the second half of the Easthampton Jazz Festival’s nighttime lineup with the Andy Jaffe Octet; it was well worth it and apparently restorative. Andy’s group featured eight of the nine members of the nonet that he leads on his 2016 Playscape recording, Arc. The woodwind player Tom Olin has passed on since its release, but the rest of the group is intact. Today is Ruby Braff’s 90th birthday anniversary. The cornetist was born in Boston in 1927. Louis Armstrong, Bix Beiderbecke, Duke Ellington, Billie Holiday, and Lester Young were his heroes. By most accounts Ruby was a prickly personality, but on all accounts he was a player dedicated to beauty. Great songs never failed him. He called his aesthetic, “adoration of the melody.” Ruby made a ton of records, not a throwaway in the bunch. February 22 was Rex Stewart's 110th birthday anniversary. The Philadelphia-born cornetist was a remarkably complete stylist whose features ranged from a 1931 assignment with Fletcher Henderson playing the lyrical solo that Bix Beiderbecke essayed on "Singin' the Blues," to portraying "Menelik, the Lion of Judah," in the "stylized jungle" manner that was synonymous with Duke Ellington. "Singin' the Blues," recorded as a memorial to Bix, dates from October 4, 1931, two months after his death on August 6.